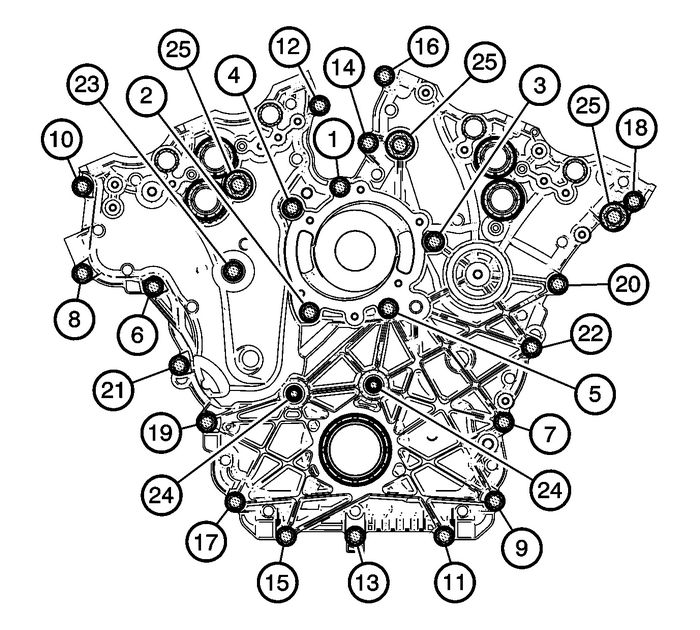 Install the 8-mm (0.315-in) guide from the EN–46109 pins into the cylinder block positions as shown. 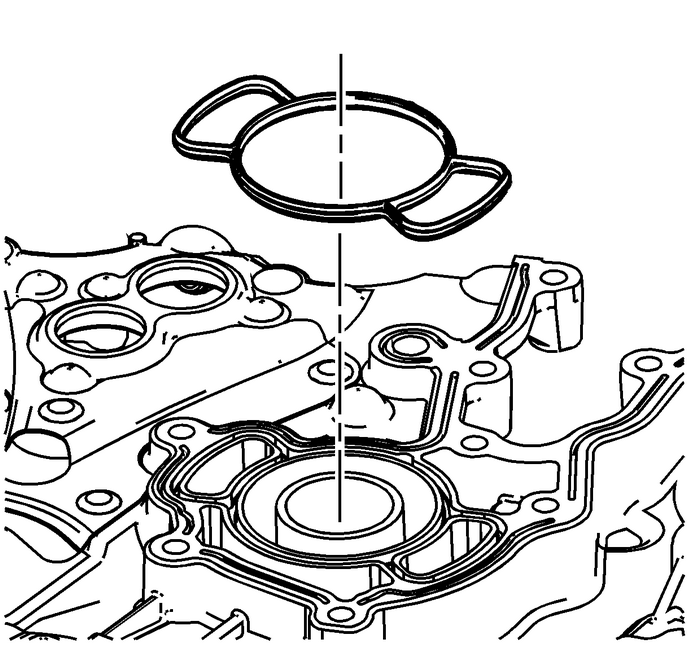 Install the NEW engine front cover to cylinder block seal. Note:No RTV sealant should be visible in the M12 bolt holes-(1) upon final assembly offront cover to engine. 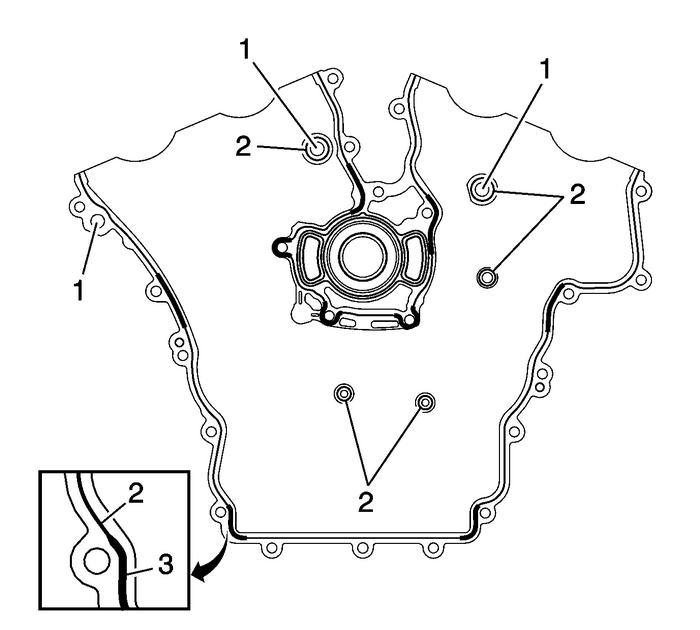 Apply a 3-mm (0.118-in) bead of RTV sealant on the engine front cover as shown-(2).Apply a 5-mm (0.197-in) bead of RTV sealant on the engine front cover as shown-(3).Refer toAdhesives, Fluids, Lubricants, and Sealersfor recommended sealant. 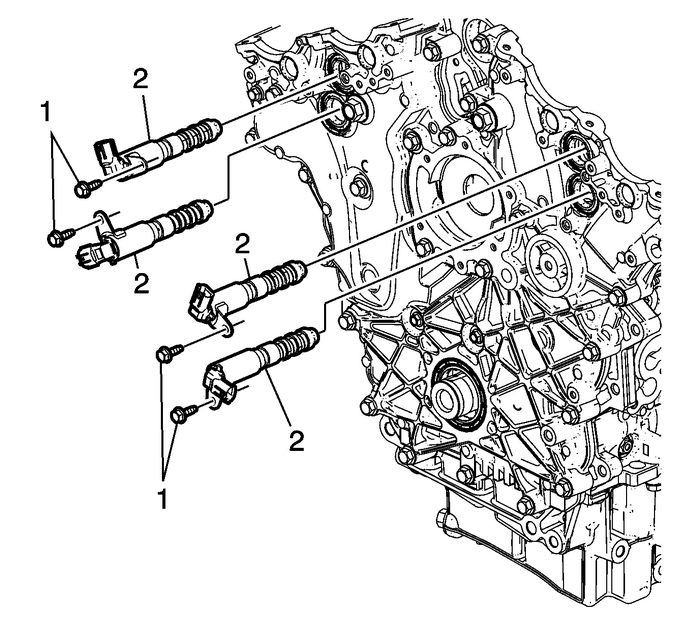 Place the engine front cover-(1) onto the EN–46109 pins and slide into position.Remove the EN–46109 pins from the cylinder block.Hand start all the engine front cover bolts. 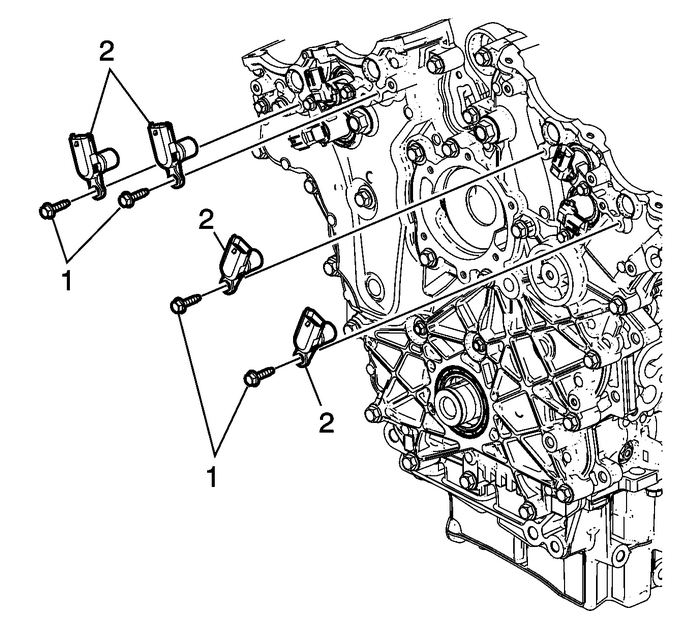 Note:Engine front cover bolts in the number-(25) location are model dependent and may notapply. Tighten the engine front cover bolts-(1–23) in the sequence shown to 20-Y (15-lb-ft).Tighten the engine front cover bolts-(1–23) a second pass in sequence to 20-Y (15-lb-ft).Tighten the engine front cover bolts-(1–23) a third pass in sequence an additional60-degrees.Tighten the engine front cover bolts-(24) to 15-Y (11-lb-ft).Tighten the engine front cover bolts-(25) to 65-Y (48-lb-ft). Place the camshaft position actuator valves-(2) in position on the front cover.Install the camshaft position actuator valve bolts-(1) and tighten to 10-Y (89-lb-in). 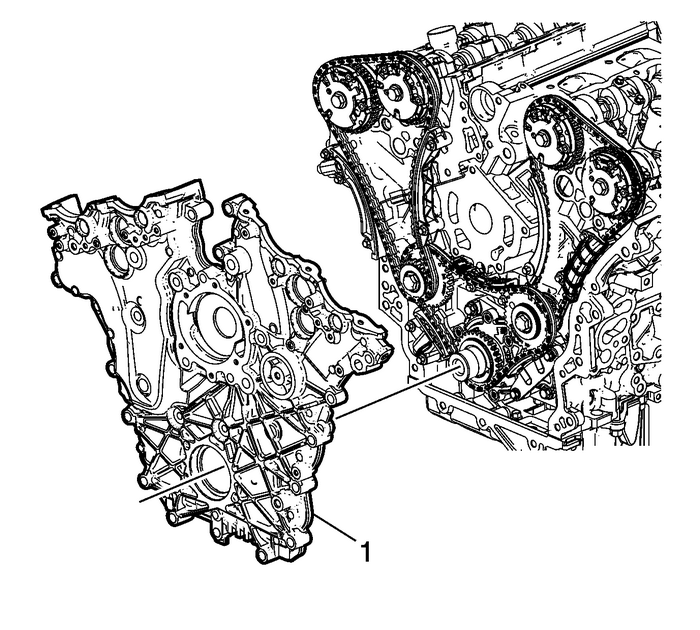 Note:Inspect the camshaft position sensor O-ring seals. 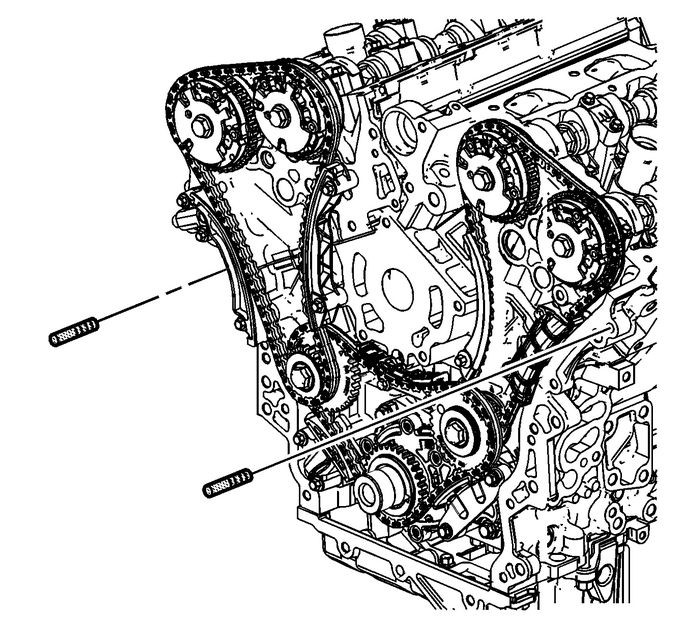 If the seals are damaged, the entirecamshaft position sensor must be replaced. Place the camshaft position sensors-(2) in position on the front cover.Install the camshaft position sensor bolts-(1) and tighten to 10-Y (89-lb-in).